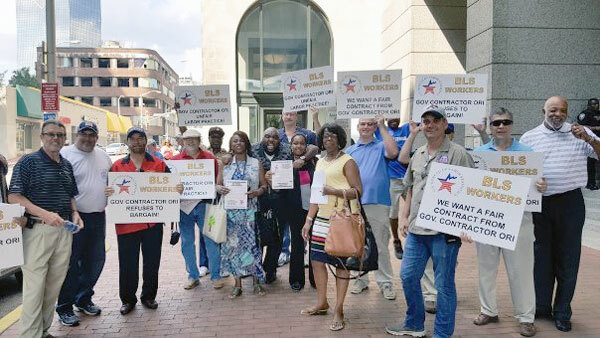 After more than a year of company stall tactics, IAM District 131 members at Office Remedies, Inc. (ORI) in Atlanta have a contract. They voted to approve a two-year pact with the Bureau of Labor Statistics contractor that will net them a 3.5 percent general wage increase over the life of the contract, a 401(k) plan and a $400 signing bonus. The deal institutes grievance and discipline procedures, as well as seniority rights. ORI hired a notorious anti-union contractor, Jackson Lewis, to intimidate workers during their union vote, and then stonewall them at the bargaining table. It insisted on meeting at night and on weekends when negotiating committee members had family obligations, causing the IAM to file an unfair labor practice charge. The tactics, which came from a Labor Department contractor, caught the eye of U.S. Rep. John Lewis (D-GA). “This is particularly concerning given that ORI is a federal contractor which may be engaging in anti-union efforts on official time and in federal facilities,” Lewis wrote in an August letter to Labor Secretary Tom Perez. The 81 ORI data collectors conduct surveys that help the Bureau of Labor Statistics keep track of employment information.